For all you E-readers out there, Life Lessons of a Harvard Reject by Peter Bennett (published October 2012) is now available on the Amazon Kindle, the world’s best-selling E-reader. 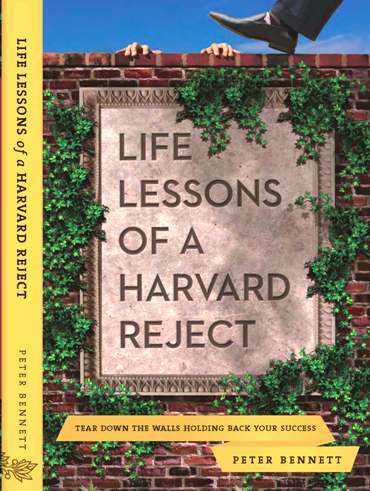 At its core, Life Lessons of a Harvard Reject motivates and inspires readers how to tear down the walls holding back their success. From the first page to the last, it also encourages people to aim farther than their reach and to HIGHER themselves when the world isn’t hiring. “A large section of the book hones in on how to expand your imagination, innovation and sense of wonder, so it’s very exciting to announce this new E-platform,” said Bennett, a Harvard Reject and Stanford graduate. For more information about the book and its life-changing lessons, taught by everyone from Socrates to Shakespeare to The Simpsons (the author is merely your guide during this self-improvement journey) please visit www.HarvardReject.com.